Chromium infiltration gives emeralds, a member of the beryl family, their distinctive bright green color. These green beauties grow under tumultuous conditions in hydrothermic veins within metamorphic formations, in mica schists, or in limestone deposits. Just like the ruby, the elements required for emeralds to form (beryllium, chromium, and vanadium) do not typically coexist upon the earth. It takes violent upheavals and roiling tectonic activity to bring these integral components together. The sheer violence surrounding the creation of emerald crystals make it rare for them to form without fissures and cracks (inclusions). 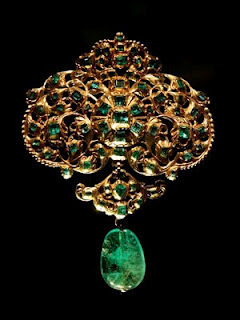 In fact, even some of the most valuable emeralds can be filled with a microscopic network of tiny cuts infused with air, mica, iron pyrite, or water, often resulting in a verdant milky appearance nicknamed jardin ('garden'). It was these delicate gardens within the precious gemstones that inspired jewelers to develop the very popular emerald cut, a rectangular step cut specifically tailored to preserve the structural integrity of delicate emeralds. Despite these flaws and their fragile structure, their miraculous and savage origins, coupled with their brilliant color and hardness, have endowed emeralds with an innate value that often renders them more valuable than diamonds of similar size and weight. 1. Contreras, Ashley. "Emeralds." Cochise College: Geology Home Page. Accessed June 22, 2012. http://skywalker.cochise.edu/wellerr/students/emeralds-ashley/emeralds.htm. 2. Clark, Don. "Gem Formation." International Gem Society. Accessed June 22, 2012. http://www.gemsociety.org/info/igem17.htm. 3. Snazzdragon: A-Z of Crystals. "Emerald." Accessed June 22, 2012. http://snazzdragon.com/main/az/stones/eme.php. 4. International Colored Gemstone Association. "Emerald." Accessed June 22, 2012. http://gemstone.org/index.php?option-com_content&view-article&id-84:sapphire&catid-1:gem-by-gem&Itemid-14.